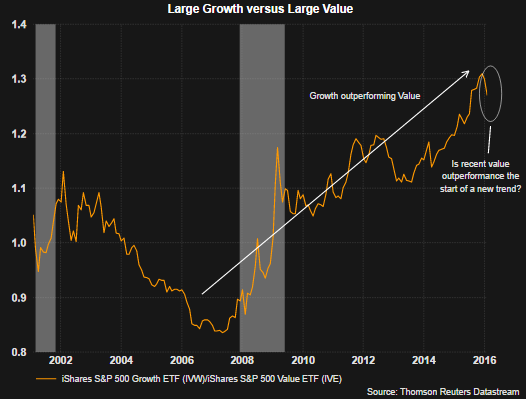 Investors not owning the basket of stocks know as the FANGs (Facebook (FB), Amazon (AMZN), Netflix (NFLX) and Google (GOOGL aka Alphabet)) in 2015 likely trailed the return of the broader market. 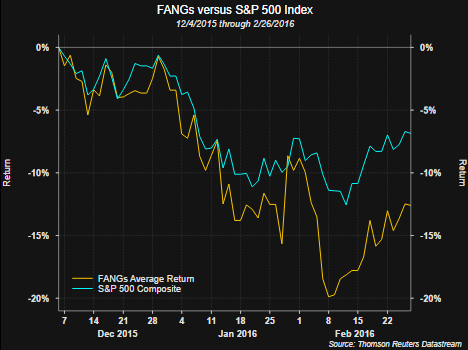 The average return of the FANGs in 2015 equalled 83% versus the S&P 500 Index return of 1.4%. 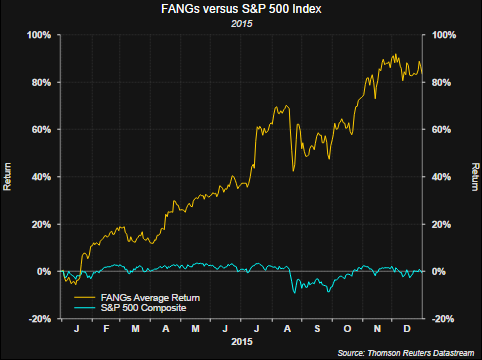 With the emotional propensity for investors to buy what feels good, if they purchased the FANG basket of stocks near year end, the return on these stocks has trailed the overall market return: -12.6% versus -6.4% for the S&P 500 Index since December 4, 2015. 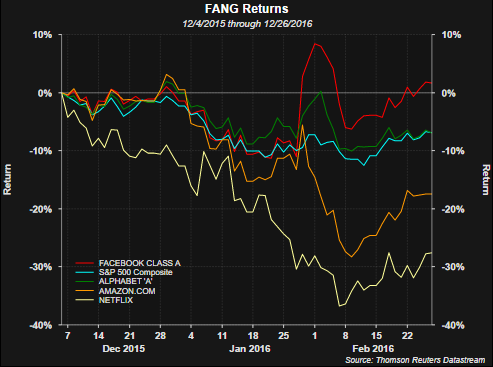 The weakest link in this basket has been Netflix which has declined 27.6% since the December peak of the FANG basket. The best performing FANG stock since their December top has been Facebook returning 1.6% and outperforming the S&P 500 Index return of -6.9%. 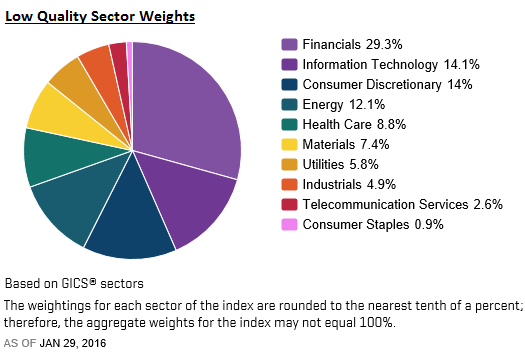 The S&P 500 Index has outperformed the other three FANGs, Alphabet, Amazon and Netflix. Evident from the below chart of the S&P 500 Index and the Dow Jones Industrial Average, the start to 2016 has been a difficult one for investors. January saw a sharp decline in the equity markets; however, the month of February is working to repair the January damage. We noted in a post at the end of the third weak of January, Sentiment Supportive Of Further Equity Gains, that sentiment data seemed overly bearish and the market could recover. 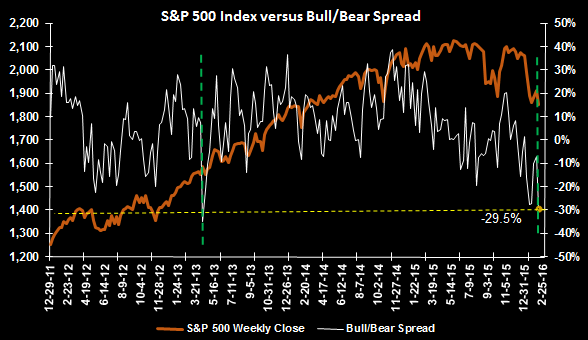 Certainly this has been the case, yet institutional and investor sentiment continues to tilt more bearish than bullish. 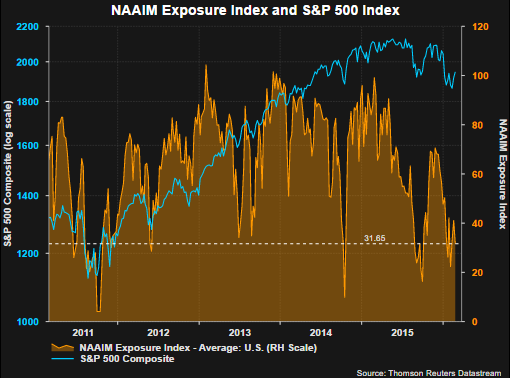 The chart below displays the NAAIM Exposure Index. The NAAIM Exposure Index consist of a weekly survey of NAAIM member firms who are active money managers and provide a number which represents their overall equity exposure at the market close on a specific day of the week, currently Wednesday. Responses are tallied and averaged to provide the average long (or short) position or all NAAIM managers, as a group. This week's data for the NAAIM Index continues to indicate active managers remain cautious on the equity market and is near levels notable for oversold markets. 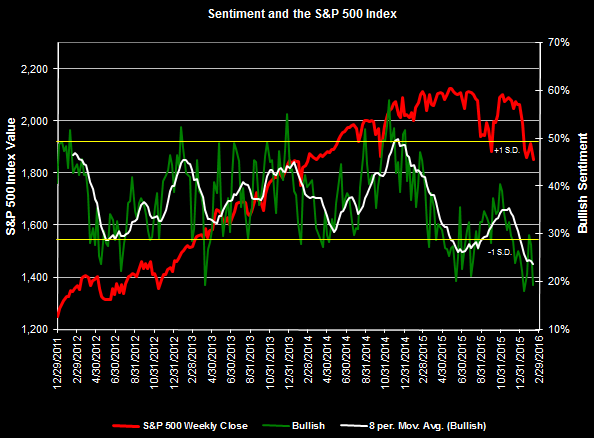 Additionally, although individual investors are slightly more bullish based on the Sentiment Survey from the American Association of Individual Investors, bullish sentiment remains at a low level. Last week's AAII report saw investor bullish sentiment increase to 31.19%, the first reading over thirty since the end of November last year. In order to smooth out the week to week volatility in the sentiment reading, we look at the 8-period moving average. 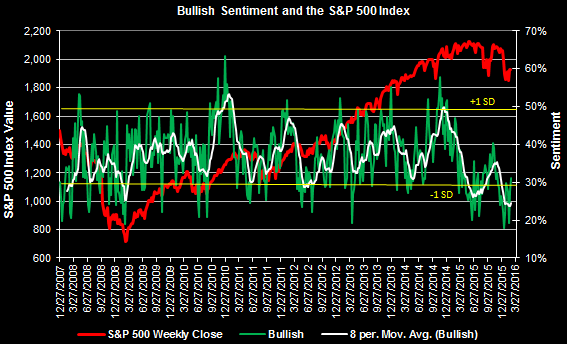 As the white line in the below sentiment chart shows, this average continues to track at an extreme level, even lower than that reached at the bottom of the financial crisis in March of 2009. One data point needing to see improvement is that associated with the consumer and a reasonably strong spending and income report was delivered for January. It appears the benefit consumers receive through low energy prices are beginning to translate into increased spending. "Personal income jumped 0.5 percent in January as did consumer spending, both readings higher than expected. Details are solidly positive with components on the income side led by wages & salaries, up a very strong 0.6 percent for the third large gain of the last four months. And year-on-year rates are climbing again with total income up 4.3 percent and with wages & salaries at 4.5 percent, which are far from torrid but the direction is definitely favorable. And consumers didn't draw from savings on their January shopping spree, with the savings rate unchanged at a very solid 5.2 percent. Components on the spending side are led by durable goods which jumped 1.2 percent and reflect strong vehicle sales in the month. Spending on services rose a monthly 0.6 percent. 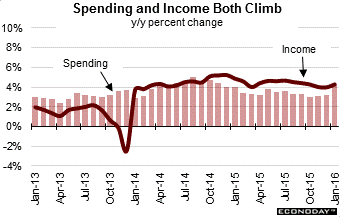 Year-on-year, spending is up 4.2 percent. Again, this isn't great but it does point to a surprisingly strong start to the first quarter which looks to double or triple the fourth-quarter's annualized growth rate of 1.0 percent." 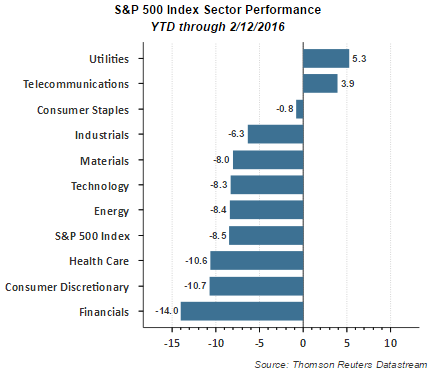 And finally, the improvement in equity returns in February is occurring in some of the more economically sensitive sectors. 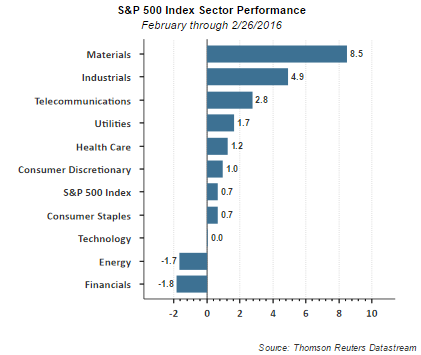 The below chart shows materials are up 8.5% this month and industrials are higher by 4.9%. 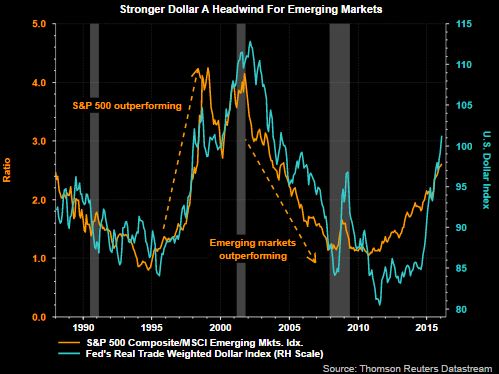 At a minimum the market may be beginning to factor in the easier earnings comparisons firms will face as they lap the headwinds from the strong US Dollar and the contraction in energy prices. One thing we know about the market is it does not move higher in a straight line. 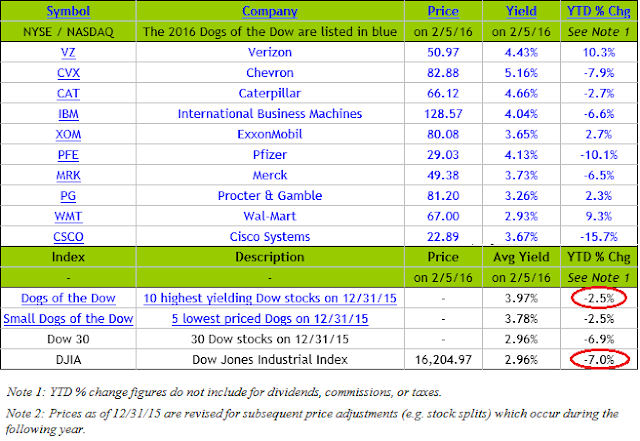 The strong recovery over the last two weeks may see some consolidation of these recent gains. However, some glimmer of hope is beginning to surface in a number of economic reports, a revised higher GDP number, an improvement in industrial production and improvement seen in the durable goods report. Everything is not roses as weakness was seen in Markit's Manufacturing PMI and the ISM Manufacturing Index. 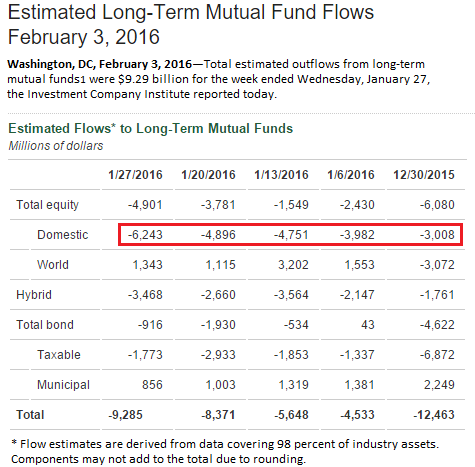 Investors continue to deal with mixed economic reports, but a number of the reports are beginning to turn positive. 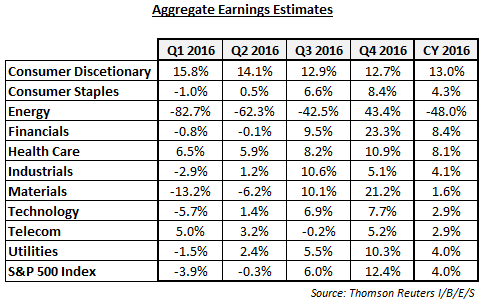 If one believes stock prices follow earnings, improvement in earnings reports would be a welcomed outcome. Yesterday, the U.S. Census Bureau released fourth quarter 2015 e-commerce sales data. The report confirmed the fact individuals are increasingly turning to the internet for their retail purchases. The orange line in the below chart shows as of the end of Q4 2015, e-commerce sales as a percentage of total sales increased to 8.6%. Also notable in the below chart is the blue line representing the YOY change in e-commerce sales: e-commerce sales grew nearly 15% in the fourth quarter last year. 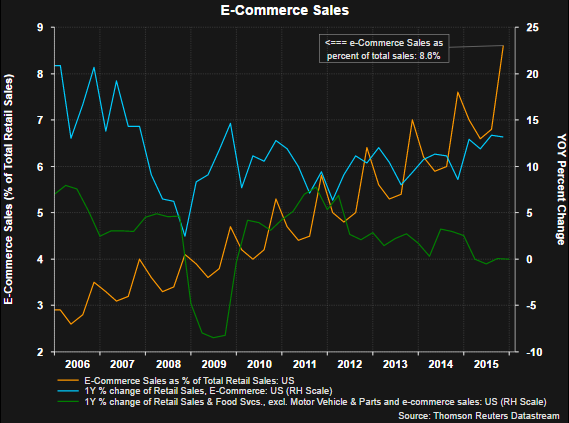 The increase in internet retail has come at the expense of brick and mortar retailers as evidenced by the near zero percentage growth rate in overall retail sales less motor vehicles and e-commerce sales (green line). 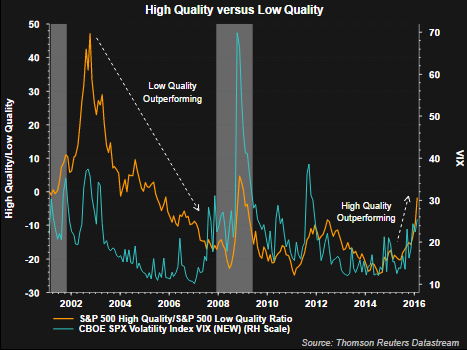 Commensurate with the increase in the market's volatility that began late last year, high quality stock outperformance has accelerated this year. 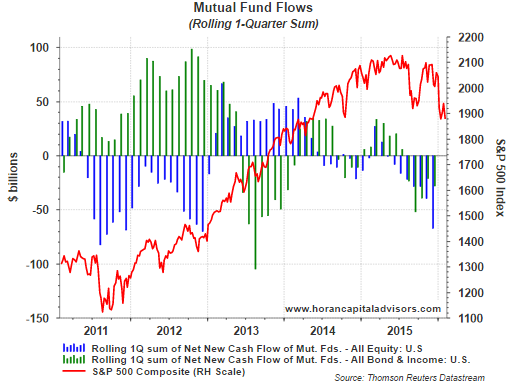 As volatility increases it is common for investors to seek the safety of higher quality equity holdings. The below chart displays the ratio of S&P's high quality index to the low quality index.The S&P Quality Ranking System measures growth and stability of earnings and recorded dividends within a single rank. S&P Low Quality Rankings are designed for exposure to constituents of the S&P 500 identified as low quality stocks, i.e., stocks with Quality Rankings of B and below. S&P High Quality Rankings are designed for exposure to constituents of the S&P 500 identified as high quality stocks, i.e., stocks with Quality Rankings of A- and above. 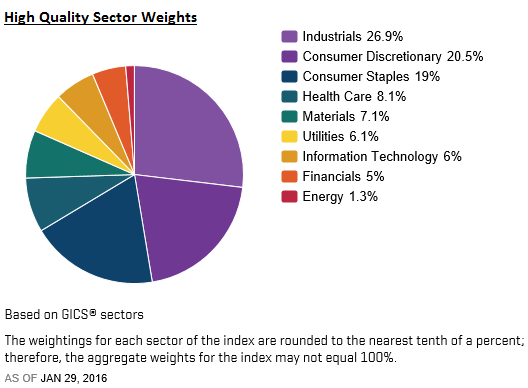 One factor contributing to the underperformance of the low quality index is the large 29% weighting in financials versus 5% in the high quality index. As the last chart below shows, financials have taken it on the chin so far this year. A significant issue facing investors is determining whether the world is entering into a global recession. 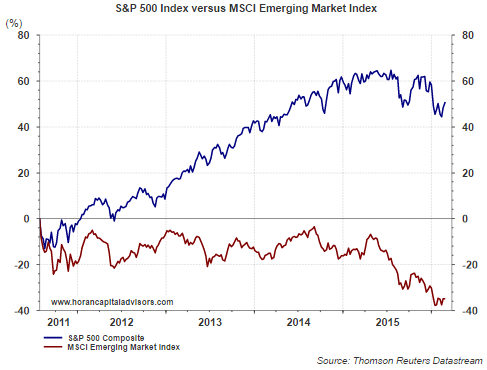 Certainly, economic activity in emerging markets has been challenged due in part to the strength of the U.S. Dollar. Global economies are also dealing with the collapse of energy prices and the negative impact energy weakness is having on the broader industrial sectors as energy capital expenditure cuts ripple through the economy. As noted in our post yesterday, historically, energy prices and equities have a positive correlation, that is, they move in the same direction. Intuitively this makes sense as a stronger global economic environment leads to a higher demand for energy resources. 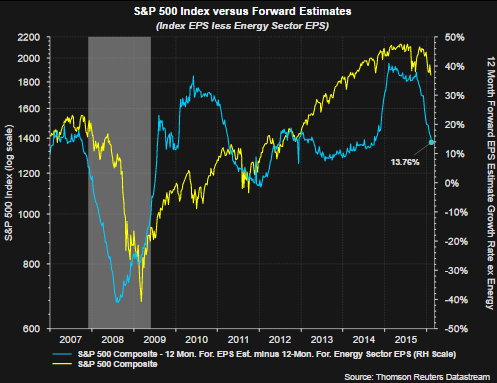 Since late 2013 this correlation broke down and energy prices began to move in the opposite direction of stocks. 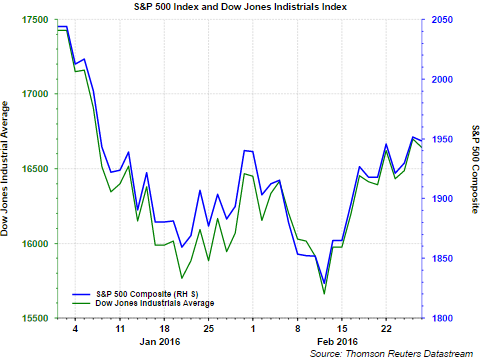 When January 2016 rolled around though, the correlation between oil and stocks once again turned positive.